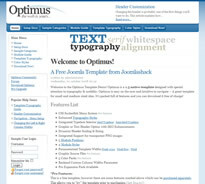 Joomlashack have released a new theme for Joomla 1.5 called Optimus and it's packed with quite a few features, you might quite like and the beauty is, you can downlaod it for free! The theme is putting a particular focus on typography and usability and if you want to take it to the next level, there is a commercial option available too. Basically, you get to try the theme for free, then you can purchase the extra features, which are listed below, if you want to take the theme to the next level. Theme features are below and the extra things you get, if you pay for it are in bold, but you can get it for free by visiting Joomlashack.